There is a huge range of activities available in the area to suit young and old, energetic and less so, and to cater for all budgets. Here are a few of the more popular excursions. 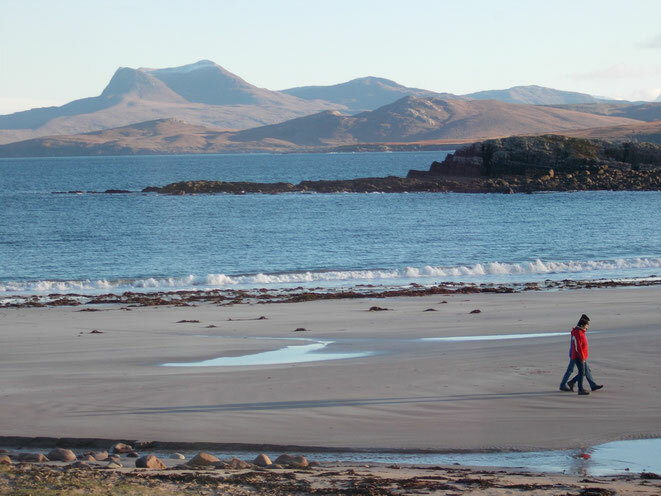 Mellon Udrigle beach is 3 miles away and one of the nicest beaches on the West Coast with a natural reef around making it safe for swimming, canoeing or sailing /windsurfing. The Walks within 10 miles of Laide are too numerous to mention, but they range from a potter down a tarmac road safely and without disturbance (Tollie Farm) and full hikes for a day or more up into the hills. There are several Munros visible from the front door including An Teallach and Stac Polly which will challenge the energetic. Maps are available to borrow. Boat rental , fishing trips and whale and wildlife watching excursions are all available from Gairloch Pier. In season, whales, dolphins, seals, porpoises and sharks and a whole range of Birds can be seen. Restaurants and Cafe's abound with the interesting Perfume Studio, the famous Old Inn in Gairloch, Shieling Restaurant, Museum Restaurant, Mountain Cafe, Gairloch Sands Restaurant etc. There is also a fish and chip shop and a Chinese takeaway in Gairloch for a break from cooking. Fine dining is also available at the Shieldaig Lodge Hotel. Lunch at the Badachro Inn is excellent. You could then investigate the Fairy Lochs where the remnants of a crashed wartime bomber can still be seen. 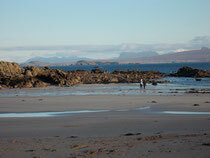 Carry on beyond Badachro to Redpoint to see where the film What I did on My Holidays was made starring Billy Connelly. Enjoy visiting one of the 3 isolated beaches there. If the weather is unkind drive up to Ullapool and enjoy some retail therapy and an Ice Cream. You might see the ferry depart for Stornoway. Other wet day places include Torridon, Applecross - the Applecross Inn is highly recommended, Kishorn, Diabeg, Plockton, Kyle of Lochalsh and even go over the Sea to Skye via the Skye Bridge. Wildlife, Climbing, Watersports, Cycling & Mountain Biking, Horse Riding & Pony Trekking, Fishing (Loch and Sea), National Trust for Scotland Gardens, Arts and Crafts, Leisure Centre and Swimming Pool, Local History, Photography, Golf and so on, the list is endless!